REACHING NEW HEIGHTS - Stanton Architects, Inc. Architect and photographer Fernando Guerra built the first known drone for architectural photography in 2010. He purchased an inexpensive drone and outfitted it with a high-definition camera and extra engines to take pictures of buildings from above. This early drone had a two-minute capacity, quickly changing the future of architectural design. Drones allow a new look and perspective into spaces with numerous angles and images. Drones also called, “UAVs,” are unmanned aerial vehicles. Exciting opportunities are on the horizon for architects. Drones are now being used within architecture and construction industries. 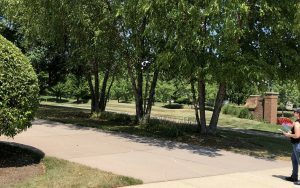 Among the many uses, drones are being used as surveying apparatuses of building sites, transport vehicles, and marketing tools. Drones provide other benefits for design and safety. Law on drone usage varies around the world. Regulations regarding flying in the dark, out of operators site, above certain altitudes, and near other structures or people are common limitations and concerns. Some countries require training programs but these are in early phases of development. What form will drones take in coming years? City development and dwellings could look space age with multiple layers of aircraft buzzing through the skies. Talk of lower level human transport, mid-level package delivery, and higher altitude commercial aircraft sounds complicated and exciting. Hopefully, emergent help for undeveloped areas and countries like Africa will arrive soon with unlimited opportunity for human mercy.